11th lunar month of 1702: his name appears for the first time on a playbill; he performs as a wakaonnagata in Ôsaka at Matsumoto Nazaemon III's theater. 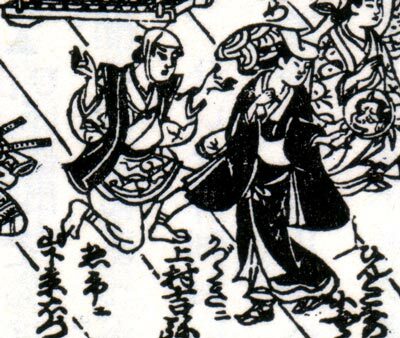 1st lunar month of 1712: Kichiya goes to Kyôto and achieves a great success at Ebisuya Shôdayû's theater by playing the role of the courtesan Matsuyama in the drama "Onna Wankyû", which is produced by Yoshizawa Ayame I; the role of Wankyû is played by Yamashita Kyôemon I. Kichiya's rank in the Kyôto hyôbanki, wakaonnagata section, is jô-jô (superior - superior). Fall 1713: Kichiya goes back to Ôsaka. 11th lunar month of 1713: Kichiya plays the role of Hinazuru in the kaomise drama "Saiwai Musume Takara no Yome Banzei Muko", which is produced at Ôsaka Tazaemon's theater by Shinozuka Shômatsu I. 1st lunar month of 1714: Kichiya's rank in the Ôsaka hyôbanki, wakaonnagata section, is jô-jô (superior - superior). He shares this ranking with Sodeshima Genji. 11th lunar month of 1717: Kichiya plays in Ôsaka at the Higashi no Shibai the role of Sagoemon's nyôbô Okichi in the kaomise drama "Meryû Oryû Kogane no Uroko", which is produced by Arashi San'emon III. 1st lunar month of 1720: Kichiya goes to Kyôto and plays the role of the keisei Miyoshino in the new year drama "Keisei Kaname no Ishi". 11th lunar month of 1722: Kichiya plays in Kyôto at Hoteiya Umenojô's theater the role of Aburaya Jûbê's spouse Okatsu in the kaomise drama "Aioi Ôshimadai"; the role of Aburaya Jûbê is played by Ichinoya Jûrobê. 7th lunar month of 1723: first Kabuki adaptation in Kyôto of the puppet theater drama "Ôtô-no-Miya Asahi no Yoroi"; Kichiya plays the role of Hayasaki [more details]. 1st lunar month of 1724: Kichiya appears on stage for the last time, in Kyôto at Hoteiya's theater, playing in the new year drama "Keisei Sone no Matsu", which is produced by Ogino Yaegiri I. 14th day of the 6th lunar month of 1724: Kichiya dies in Kyôto; his tombstone is located in the precincts of the Jôrakuji temple in Kyôto. Uemura Kichiya III was active in Kamigata, performing as an onnagata actor from the beginning of the 1700s to the beginning of the 1720s. He excelled in nyôbô roles. He was nicknamed Kokichiya (literally "the little Kichiya") as a reference to Ôkichiya (literally "the great Kichiya"), which was the nickname of the legendary founder of the line Uemura Kichiya I.